Evolutionary biologist Clive Finlayson, of the Gibraltar Museum, was standing in the vestibule of Gorham’s Cave, a magnificent tabernacle of limestone opening to the sea on the Rock of Gibraltar. Inside, fantastic excretions of flowstone drooled from the ceiling of the massive nave. The stratigraphy in the cave is pocked with evidence of Neanderthal occupation going back 125,000 years, including stone spearpoints and scrapers, charred pine nuts, and the remains of ancient hearths. Two years ago, Finlayson and his colleagues used radiocarbon dating to determine that the embers in some of those fireplaces died out only 28,000 years agoâ€”the last known trace of Neanderthals on Earth. Imagine it: the last outpost of the Neanderthals, a tiny remaining group of fur-clad hunters sitting on the edge of the earth, looking out over the ocean as the sun sets, warming their hands around the last fire. Going gently into that good night. 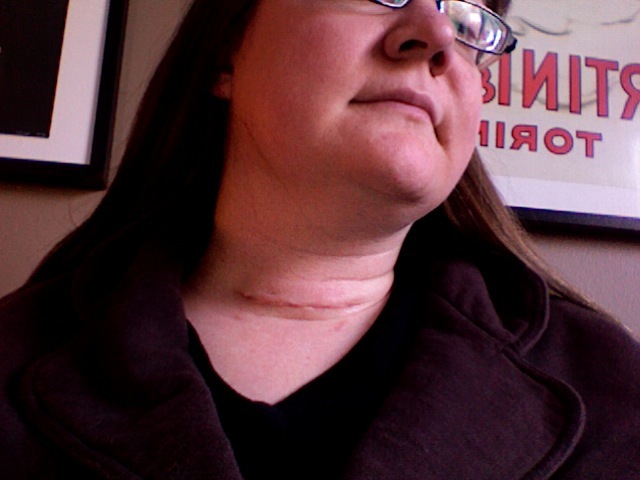 For those who are curious, and for those facing this exact surgery. The body takes it’s time to heal. This is how one learns to be patient, I suppose. It heals at its own rate, and it probably takes a full year or more before you get to see what it will look like as a permanent scar. Even then, I wonder; there are lots of products you can put on scars these days. I put vitamin e on mine during the day, and zinc (diaper rash cream, yes indeed) on it during the night. When do you become a Survivor? In the SL cancer survivors group meeting today, a friend raised the question of the definition of the term “survivor”. For most of us, we understood it as being a person who has gone into remission. But that’s not the definition they use. (And by “they” I think I mean the American Cancer Society.) To them, you become a survivor the moment you get your diagnosis. We debated that. I understand wanting to use the term that way, to help people stay out of victimhood. (Though: sometimes you really are a victim. Do we use the world “survivor” to obscure this fact? Is it healthy to obscure it?) The leader of the group is a fan of this method, and I’m sympathetic to her motives. Who wants to tell someone that they’re a victim right now, but one day soon they’re going to move into the role of survivor? (Now that I think of it, that doesn’t sound all that bad at all.) We discussed the concept at some length. Many of us had moments where we felt we moved into survivorship; for some, you become a survivor the moment you decide to fight back. The youngest of us in the group (aged 26, stage 4 lymphoma, currently in remission) says he decided to fight back a second after he got the diagnosis. I didn’t. 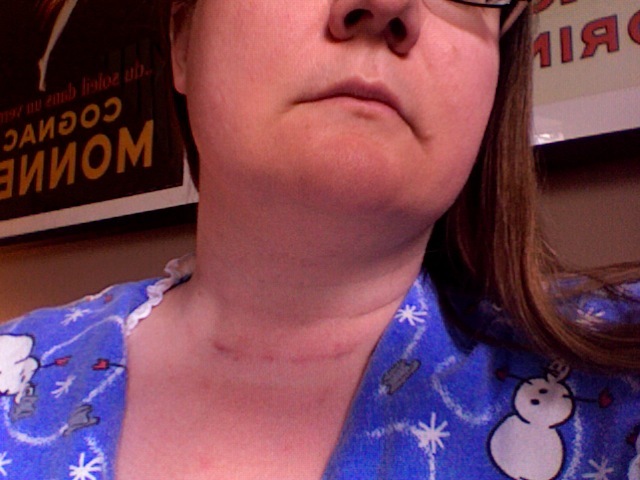 For the first few weeks I felt that my incision belonged to my surgeon. I wasn’t a “survivor”. I was a battleground. I felt very passive. Now, even though I’m still struggling with some after effects and I probably have another 6 months before I start to get back to being my old self, I feel like a survivor. I think it might come when you decide to claim it. At the beginning it was only fear, a fate I couldn’t bear to think about. It was too big for me to cope with. 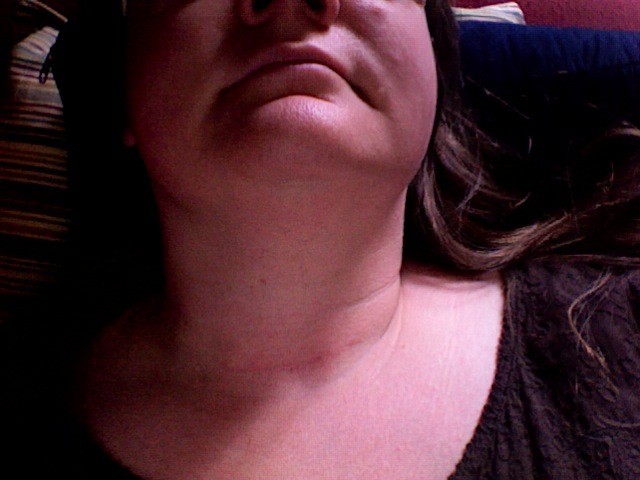 Once the surgery was over with, I felt certain that it didn’t matter to me anymore, the treatment was already done, right? The thing was out, it was over. I underestimated the importance of that final, confirmed diagnosis. It was cancer. I couldn’t say the word. I thought I had accepted it then, but I really hadn’t. Through treatment I felt like I was going through the motions laid out by my doctor and the nuclear techs. I did what I was told, exactly the way I was told to do it. I clung to the lists of rules. I didn’t take shortcuts. It was like dance by numbers, follow the pattern of feet on the floor. Except in my case it was the outline of my body, and my job was to lay down and wait it out. I didn’t feel like a survivor then either. I felt pretty much like a puppet whose strings are pulled by someone more knowledgeable and more powerful. I was an avatar of cancer treatment. I didn’t feel like a survivor when the depression sunk in, when I couldn’t stop crying. When my hips burned in pain. I didn’t feel like a survivor when I struggled just to walk from my bedroom to the bathroom. I definitely didn’t feel like a survivor the day after my wedding, when getting out of bed caused pain in every joint and all I wanted to do was lie down and cry. I didn’t even feel like a survivor when my endocrinologist gave me the first all clear. (Hopefully I’ll get the second all clear in a couple of weeks when I see her again. Apparently this life is going to be a series of all-clears, or the opposite. If you never have cancer, you don’t get told that you still don’t have it. But once you’ve had it, I guess they’re always going to be checking, and giving me the all-clear, again and again and again. Unless I’m unlucky.) You’d think that would be the moment, when you’re finished and it’s gone. Nope. I think I started to feel like a survivor when started building it and communicating about it. I blogged about it all the way along, that isn’t what I mean. There was something pretty magical about turning it into virtual-physical form that made a huge difference. It made me less afraid. No, not less afraid: less in denial. Once I turned the experience into something concrete, and other people started experiencing it with me in this way, telescoped out with lots of discussion and questions, it was then I started to feel like a survivor. Maybe you become a survivor when you’re no longer in denial about what’s happening to you. You survive the denial, you move past it. It’s harder to move past cancer. Maybe we need more words for this. Words that pop into mind that are useful: victim (because let’s face it; this is one of the stages we go through), battleground, warrior, survivor. If there’s one thing I’ve learned through all this it’s that there aren’t enough words in the English language. Not by a long shot. I was asked recently to fill out a survey about the situation, goals, and ideas of “future library leaders”. One of the very first questions the survey asked was a true or false type thing; there was a statement and I was asked my opinion about it. The statement said something like this: “In the future, 100% of questions will be directed first at Google.” It was worded better than that, though. I disagreed. I explained why, but now that I’ve answered this question, I want to elaborate on my answer, and why I’m positive that I’m right. I don’t mean to imply that Google will become less important. If anything, it will probably become more important. It works. But I don’t think all questions will start there. I think we’re missing something really key. While everyone loves Google and uses it, most people would prefer to ask their questions of real people, in digital form. In every online community of which I’m a part, there is this constant problem; new users “abusing” the group by picking their brains. On Feminist, the erudite community on livejournal, there were so many questions looking for help writing women’s studies papers that schoolwork-related questions were actually banned from the community. Similarly, on Academics Anon, another livejournal community, many, many questions are posted that are answered thus: “Google is your friend.” There is a near-constant conversation going on about how people don’t read and can’t they just google that citation question, and why does everyone expect us to answer all these silly questions that we’ve answered already 15000 times? The crankiness about it is one thing (and I understand it, in spite of being a librarian). The fact that anyone would rather face that kind of hostility and ask their question to a community of jaded academics (the basic premise of the community) rather than simply type the keywords of their question into google (how to cite a website, etc.) is telling. In the last two days, as I’ve been preparing for Burning Life, the same thing is happening again. In order to get into the land set aside for Burning Life, you have to join a group. The chat related to that group is almost 99% basic questions that are all answered on Burning Life’s webpages, and the natives are getting very restless. Those webpages are actually very clear and well constructed, but when redirected to these pages, the question-askers are getting mightily upset, as if being asked to read a webpage is some kind of insult. I find this fascinating. They don’t want to read the webpage, even though they are told repeatedly that the answer to their question is there. They want to be told. They want their hands held. They want the personal touch. All digitally, of course. So why is it that reference as a service is dying by this desire for personal communication is so prominent in online communities? I think the key to it is trust. And it’s not that these new Burning Life folks trust the rest of us in the group as individuals. They trust that we went through this process already and know how to do it. They trust that we have expertise, and an unwillingness to share it with them offends them. The same is true in the feminist and academics community; they don’t come to us because they like us as people, or find us approachable. They come to us because they trust that we know what we’re talking about. What makes this all the more confusing is that there’s that constant refrain out there about how you never know who you’re dealing with on the internet, but no one takes that too seriously in these cases. They don’t care if you’re really a dog. They only care that you know something about this very specific category of knowledge, and your participation in this forum provides that degree of trustworthiness. How can libraries get themselves into that kind of category? I’m not sure. But I think clearly defining and expressing our particular expertise is part of it. The rest is an open question. You’ve probably heard of Burning Man, the art festival that happens in the middle of the Nevada desert every year; Second Life has a Burning Man festival of its own. It’s called Burning Life. It’s run by Second Life owners, Linden Labs, and they put up plots of land for grabs at intervals this week. So the festival is open to anyone who can grab a plot. I missed the 5am rush for land this morning, but I got in at 1pm today, and got myself a plot. I was very lucky to get it; I took off my hair and all of my attachments in order to teleport in faster, so I grabbed the plot not naked but bald and shoeless. Second Life events are amazing, so how could I pass up this one? I built a light version of this several weeks ago for fun. Basically, I recorded 6 notes in a major chord. In this build, I created frames and “tacked” sheets up on them. The sheets each contain one of those notes, and when you walk through them, the note plays. I put them in sets, so each row is one incidence of the chord. You can run through it in any direction you want, creating different variations on the chord. I really wanted to do pachelbel’s canon, and while I can see exactly how to do it, it has to be in a difference space. It needs to be a long loop, not strips. Pachelbel’s canon can’t be played all notes at once and sound good. So I reverted back to the major chord. There’s no dissonance in it. It doesn’t matter which side you start on. I want this build to be for groups to run through, and the sound of a major chord sounding in places like that is very ethereal. I built a tiny campsite above it, because that’s probably going to be the best place to sit and listen while people run around below. I’m really looking forward to Burning Life. It runs from September 27 through October 5. Got an account? Come visit! It should be interesting. I’m proud to finally present one of my summer projects: University of Toronto Mississauga library’s Orientation Video, Going for Gold.